I am beginning research into switching over to a bagged, or premixed clay. Which one to choose? Only time will tell. I will put all the clays I can find through a battery of tests, the first of which is the throwdown! Which clay works best for me on the potter’s wheel? Over the next week I will give in-depth reviews of my experience with a number of commercial clay bodies. Until now, I have always mixed my own. I really don’t mind the labor, and have never had a problem with dust, due to my practice of always ventilating and wearing a good quality NIOSH approved Silica Dust Respirator. I even find the sort of sweaty, heavy, grungy work of mixing clay therapeutic. I take pride and joy in the fact that I am responsible for the formulation and quality control of everything I use. This idea to switch to a commercially made clay body did not come easily. The main thing steering me down this path is that here at the U of L ceramics studio, we do not have a pug mill. Even though I have always spoken highly of pug mill usage, I apparently never really fully appreciated them until I no longer had access to one. Pugmills are machines that homogenize, compress, and de-air the clay, making it much more plastic, workable, and dense. Comparatively, non-pugged clay is like the sand that makes up a sand castle, while pugged clay is like taffy. The process of compressing and de-airing causes a suction between the tightly packed particles. This difference is night and day. I have been trying a lot of things to alter my clay body to make it more workable, to no avail. No matter what, the clay falls far ‘short’ of my demands without a pugmill. So the search is on. I started by asking friends who also work in midrange temperatures what cay bodies they like. My requirements are that it needs to be white so my glazes appear nice and bright, it needs to be smooth because I use a sponge to smooth out the edges of parts, and it needs to come at least sort of close to fitting my glazes, meaning that the thermal expansion (and therefore contraction) rate is matched. This will avoid cracks in the glaze that I find for the most part unsightly, not to mention that they can compromise the strength of my pots. I can always alter the glaze a bit, but not too much or it will lose its distinctive characteristics and become a different glaze altogether. I will cover all of these aspects as the testing continues throughout the summer. I started by acquiring a bag of each candidate. This week, the first round will be Standard Clay’s #213, And Highwater’s Helios and Little Loafer’s. I have a sample bag of Matt and Dave’s Porcelain for the People in the mail, which I am excited to try as well. I will put them through a number of tests before I make any decisions, and also, I would like to find another three to try. Anyone who has a suggestion PLEASE let me know in the comments below. Anyways, the first test was based on how well the clay throws. Could I see myself throwing pots every day, forever, with this clay? This is a pretty good test to do. For this event, I chose three forms with varying demands. 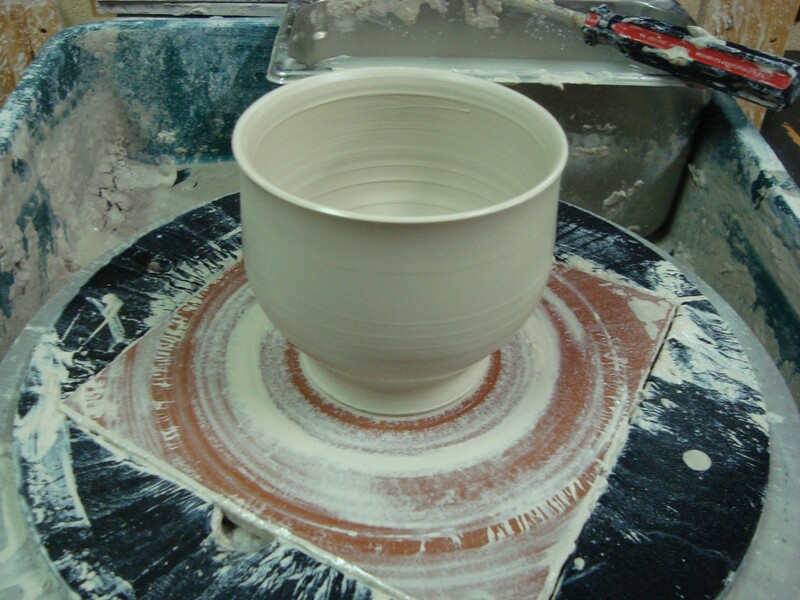 A wide shallow bowl will test the clay’s willingness to stand against gravity, to not sag or slump. A thin-walled tumbler will test the clay’s willingnesss or ability to be formed with subtlety, and to stand tall while eggshell thin. The coffee mug will test the clay’s performance in a handle pulling situation, and yes, I consider pulling handles to be essentially the same thing as throwing. Each day this week, I will give a review of the throwing experience of each one. I have been told by many people that I could be a great food critic, because of the way I talk about food, analytical, critical, and descriptive, especially in the slight nuances. I intend to do that with theses clays. Bear in mind that these are just my opinions, and that it applies to how I like to work only. The point of my writing this is for my own notes, and to help anyone else in the same position I am in (lost in the woods, sort of scared). I have been reading some reviews of clay that basically say “throws good, looks white, didn’t S-crack. That won’t help me, so I will try to really go into it here. Check back tomorrow for the first clay body in the throwdown, Highwater Clay’s Little Loafer’s. Also, PLEASE let me know if there is a great clay that’s worth a try, that I haven’t mentioned. Like I said, I’m in the dark here… Thanks! You will LOVE Helios if you love porcelain anywhere near as much as I do. I have used it in ^10 oxidation, ^10reduction, and most recently ^6 oxidation. At ^6 it is still really strong, it took me a while to smash a second before throwing it in the studio trash recently. I was really surprised at the strength of it at ^6. I’ve tried other clays, but I always go back to Helios regardless of the price. Good Luck! Thanks for the review. I’m following with interest. I’ve been using B-mix for a specific application and have been thoroughly disgusted with Laguna’s quality control, as well as their dismissive attitude. And, just to be clear, I’m not referring to Matthew in the Ohio branch — he was as “punked” by the California plant’s shipment to me as I was. Anyway, I’m looking for an alternative to B-mix that is affordable. Meanwhile, I’m using Coleman porcelain which is just fabulous stuff (don’t tell Turner!). I did one time use a little b-mix, and I think Loafer’s would be a fabulous substitute. It is very gummy in the exact same way. The feldspar in both is PV Clay, I’m pretty sure. I have read a lot of things in my research so far that likens the two. I’m adding to the list P-5 by Miller, and Laguna #16 WC617. Just curious, what exactly was the QC issue? I’ve used B-mix for a number of years now. For me it’s always been a practical substitute for porcelain in this: I don’t need porcelain’s translucence NOR its whiteness. What I do require is that it be as toothless as a newborn (not while throwing, rather, without grain when fired…..but, dang it, I choose my metaphors by literary quality, not by accuracy). Anyway, B-mix already has an inherent, fatal flaw: It’s got something that is exceptionally organic. How did I sus this’n out? Make a slip out of it. Within one week if you get your nose anywhere NEAR that slurry (like, say, in the same county) the smell will knock you over. But I learned to live with it. I had to bisque two cones higher (and that didn’t always do the trick), and I cussed a lot (that didn’t do the trick either, but I felt better). But last fall I ordered my usual split pallet of 3/4 ton of B-mix, the rest stoneware. And I started right in throwing some bowls. It felt funny. Not quite as smooth as I was used to. But I lulled myself into liking it because, dang it, it actually threw better (as it had a little tooth to it). But when I set about trimming those bowls the next day it didn’t take long (the first pass of the bowl around my cutter) before I realized that I was trimming something with the same tooth as a grogged stoneware. And as if that wasn’t bad enough, when it was fired all the way, that grit was more pronounced and sharper than a grogged porcelain. I always sand the bottoms of every pot that comes out of my kiln, but this stuff was nearly impossible to grind smooth enough to sell. And here’s the almost unbelievable part: That B-mix was shipped to the Ohio plant FROM THE CALIFORNIA PLANT because the Ohio plant was “running behind”. ….and California, I am led to believe, knew about the bad clay. And then came the insult to injury…. I calmly ripped into the rest of the 3/4 ton to find out how many boxes had that batch number on them. And I was relieved to find that only a dozen boxes had that serial number. Turns out that the rest of the 3/4 ton was equally bad — just not in the same way. I couldn’t fire the gas out of it. Did I mention that I had really good sales at the annual “Art Fair Garage Sale”? Just kidding. Thanks for the really nice story, but sorry to hear your woes. Gas bubbles and metal chunks are what is spurring me to go for bagged clay, the worm fuzzy blanket of hope has just been lifted. brrrrrrrrrr. Also, did we meet in Cambridge Pottery Fest last year through Randy Becker? I think we might have. Could be someone else. Hey, thanks for the mention in the storque. As to meeting at Cambridge Fest — I’d love to make it up there some time, but no, you didn’t meet me there. You’re probably thinking of the dark, sinister, and evil Mike BAUM. Our names are often confused, but when you DO finally meet me, you will find that, unlike Baum, I am sweetness and light. Reading your reviews with great interest. I’m in the midst of choosing a clay body too. I live in Puerto Rico but get my clay from Link at Kentucky Mudworks! Got to love the internet…and USPS flat rate priority mail boxes! I’m about to start glaze testing, with B-mix and Standard’s new 240 (Link special ordered it for me have you considered that body?) So far, I prefer the 240– I really like how it throws. It will be interesting to see how both bodies take my cone 6 glazes. Looking forward to the rest of your reviews. Might I suggest Frost (Southern Ice’s cone 6 sibling) or Hagi porcelain for your testing. Both are from Laguna. I’ve been using a clay I get from Northeast Ceramic Supply in Troy NY. It used to be a stock clay, but they discontinued making it as stock so I special order it, but they usually have some on hand because I order it regularly. It’s called “Shatz”. It’s whiter than b-mix, smooth and throws very well. It’s not quite as porcelanous as Miller 15 and 16, but I think it’s easier to throw (and less expensive) than they are. It’s very forgiving in firing and I use it often in raku without any cracking. Back to the B-mix revelation (!!!!! ): SO THIS EXPLAINS IT. Well gee whiz and golly and I’ve been sanding and puzzling what-the-? is going on here for too long. Like, it must be ME. I also seek a clay ssmoooooooth and white enough for me to change it to anything I want. I’ve tried Laguna’s Dover White (something) but it has some grit in it. Oh, and wait til I tell Mike Baum what I read here. I was wondering what program you use to compose your web site? It is very nice and I like all the links to other sites. I have tried Standards #365 English grolleg porcelain. It throws well when wedged well, trims very nicely, takes glaze well without crazing with most glazes. Quality control at times may be an issue. I had 50# that had some kind of hard off colored clay in it, not always noticable until you go to trim it and it trimmed very uneven as it seemed to dry quicker than the rest of the body. Works well for raku and saggar firing also. Fals a slight bit short. Well my most recent complaint about Standard #365 is is seems to crack easily while drying. I bought 200# of Standard #365 English porcelain, cleaned Laguna B-Mix out of the pug mill and threw in the #365. Last weekend I threw six pieces after pugging it for about 30 minutes. It took longer to dry than anything that I’ve used and when almost dry four of the six pieces cracked. I threw a variety of shapes and sized and mostly the bottoms of the pieces cracked (s shaped ). The large pie plate cracked where I had crimped the top edge at every point! I did use a sponge on the edge to clean it up a bit and the day after that was when it cracked. Can’t think of what to do differently. Was wondering if the formulation could be bad! Any ideas? Porcelain is just a tricky material to work with. I slow dry my work for up to 5 days before I flip the pots, 7-10 days before trimming. Patience is required. It is not as forgiving as B-mix.